Snoring can be a real problem, not only for the person who snores, but for the partner and other family members who live with the snorer – but did you know that habitual snorers can be at risk for serious health problems, including obstructive sleep apnea? Sleep apnea is a disorder that occurs when a person repeatedly stops breathing during their sleep (lasting from a few seconds to several minutes), as a result, limiting oxygen throughout the body and the brain. Sleep apnea can affect anyone at any age, even children. Obstructive Sleep Apnea (OSA) is the most common type of sleep apnea. It occurs when the soft tissue in the back of the throat relaxes during sleep and blocks the airway, often causing you to snore loudly. If left untreated, sleep apnea can result in other health problems, including: high blood pressure, diabetes, heart problems, headaches, depression. 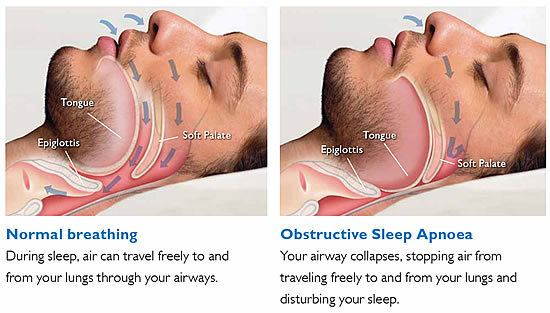 Our office treats obstructive sleep apnea with SomnoDent® therapy (an OTA) for restful nights and refreshing days! 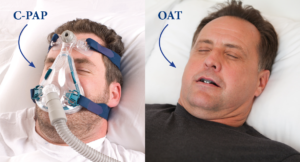 An oral appliance and an alternative to CPAP therapy for mild to moderate obstructive sleep apnea. The appliance fits in your mouth much like a mouth guard or retainer. This will prevent the collapse of the tongue and soft tissues in the back of your throat. The appliance provides adjustable levels of the lower jaw advancement, improving the comfort and effectiveness of treatment. Yes. The U.S. Food and Drug Administration (FDA) has classified oral appliances as Class II medical devices, and many insurance coverages include coverage for this therapy under their medical plans. Also, the criteria developed by the American Academy or Sleep Medicine (AASM) define obstructive sleep apnea as a medical condition that can be treated by dental professionals who have advanced training in dental sleep medicine. Patients are referred for this treatment by their physicians only after a sleep study establishes a diagnosis of obstructive sleep apnea. WHAT ARE THE INDICATIONS FOR ORAL APPLIANCE THERAY? Dentists with advanced training in the field of dental sleep medicine are recommended for fitting and installing oral appliances. Affordable Dental Care PC and Dr. Pinkhasova are experts in this field and can truly help those with sleeping and snoring in Rego Park, Forest Hills and Queens area of New York. The first step is to schedule an appointment. If you are a candidate, you will be referred for Home Sleep Testing (your medical insurance will be contacted for an approval for Home Sleep Testing). Upon approval from your medical insurance, a Home Sleep Testing device can be shipped directly to your home, where you will able to perform the test. After the test is completed and processed, a complete report of your sleep study will be sent to your dentist. WILL THE ORAL APPLIANCE BE COVERED BY MY MEDICAL INSURANCE? Most medical insurances do have coverage for sleep apnea treatments. Silent Nite® helps to mitigate and prevent the disruptive and unhealthy affects of snoring and sleep apnea. SomnoDent® therapy: Flex has a soft inner liner which maintains retention and offers premium patient comfort. IF YOU ARE SUFFERING FROM SLEEP APNEA AND OR SNORING PROBLEMS, SIMPLY SCHEDULE AN APPOINTMENT FOR CONSULTATION ON OUR WEBSITE OR BY CALLING US DIRECTLY AT (718)897-3434.